Group Practices are held on Mondays, Wednesdays and Thursdays. Though stated, types of practices may be varied by the teacher to enhance interests and provide best benefits to practitioners. All practices are conducted in Chinese. Note: We are closed on Tuesdays. Group practices are also held in the mornings on Saturdays and Sundays at the breezy and peaceful Lower Pierce Reservoir. 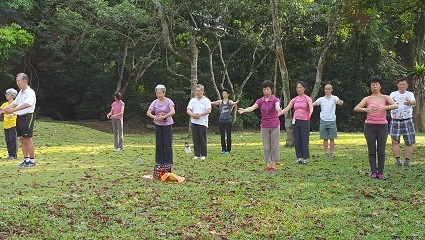 The natural scenery of green grass, trees and blue lake coupled with swinging monkeys and chirping birds provide a stress-free environment for qigong practice. (On entering the reservoir, look right for a staircase and move your way up to find and open field).